Jon: The inspiration for AutisMate and building this company SpecialNeedsWare really came out of a personal connection I had with the autism community. My younger brother has autism and has been challenged by a number of communication and behavioral issues. He had used many of the existing technologies and interventions, but had limited success with them. I realized there was a massive need for him and other children like him who could use a more intuitive and visual approach to developing communication and behavioral skills. As such, I initially partnered with a small group of therapists, researchers and educators to begin developing the first version of AutisMate. Over the last year and a half, we built an incredible advisory network of over 300 researchers, clinicians, industry experts, educators and parents. Additionally, we formed a formal advisory board of some of the country’s most renowned assistive technology professionals. It’s been a combination of this real clinical feedback that’s not only supported in research but in real clinical practice that has allowed us to build this whole new approach to communication and behavioral development. Ankit: We released a beta version of the app last April into the app store and launched the full version at the end of last next week. Ankit: AutisMate is a culmination of 1.5 years of research and development. We’ve piloted AutisMate both nationally and internationally across large school districts, research institutions, specialized autism schools and in the homes of thousands of families. Ankit: My favorite feature is definitely the GPS and ability to automatically be presented with scenes that are relevant to your location. It’s amazing what the latest mobile and tablet technology is capable of and great to use these features to help those with special needs. Ankit: The visual scenes are my favorite part because of the versatility in what they can do to promote a wide variety of different skills. Research has shown that visual scenes are more intuitive than grid-based AAC for many learners. The scenes can simultaneously allow a beginning communicator to communicate with minimal language skills and build the necessary language skills to successfully progress to our grid-based sentence builder. What skills were you hoping to help the end-user to develop? Ankit: AutisMate is the only communication platform that integrates behavioral learning as well. Behavioral instruction is inherently linked to communication. After all, how can you teach different daily living or other behavioral skills without bridging the communication gap? Before AutisMate, intervention strategies for communication and behavioral development were very disconnected and that’s why we’ve created this holistic approach that combines communication and behavior into one single platform. Furthermore, we recognize that the needs of each individual are going to be different. Therefore, we aren’t necessarily focusing on a specific area of needs but rather providing a fully customizable platform that can be tailored to those needs and grow with you as those needs change over time. Ankit: Our approach is helping young children all the way to adults. That’s why AutisMate is so unique because the visual tools are able to grow with you over time. There isn’t necessarily an age range that is most appropriate for AutisMate, but rather it depends on what your specific needs are at this moment in time. AutisMate has had some of the greatest success with those on the moderate to severe side of the spectrum with both communication and behavioral challenges. However, AutisMate is also being used with higher functioning individuals who are likely focusing on behavioral skills only. Ankit: We release updates almost once a month. We are constantly improving AutisMate and are invested in making it one of the best solutions available for clinicians, educators and parents alike. Our first major release with the full version was released at the end of last week. We already have a full year of new updates planned for AutisMate along with new products for the Autism Community. Why did you choose these updates? Ankit: The updates that we chose are based on feedback that is coming from practical use in the clinical, educational and home settings. Our development approach is heavily based on not only what is proven in research but also in real clinical practice. ★ AutisMate’s comprehensive approach to communication and behavior develops these skills at the same time, allowing them to build on each other. ★ AutisMate is personalized to each user and grows with their changing needs. ★ AutisMate saves you time easy customization and pre-created content for your communication and behavioral needs – limited content currently available. More content coming soon, and accessible to existing users. ➤ Content Library – limited content currently available. More content coming soon, and accessible to existing users. Research shows that visual scenes, such as those found in AutisMate, are more effective for young children and those with complex communication needs that are just beginning to communicate. We also provide a fully featured sentence builder (grid-based AAC) that allows users to build up to complex communication with large vocabularies. Our hybrid approach, that allows you to use choice boards within scenes, is a great stepping stone between the two! We also integrate research-based applied behavior analysis (ABA) strategies such as video-modeling, visual schedules and visual stories to promote behavior and social skills in addition to communication. 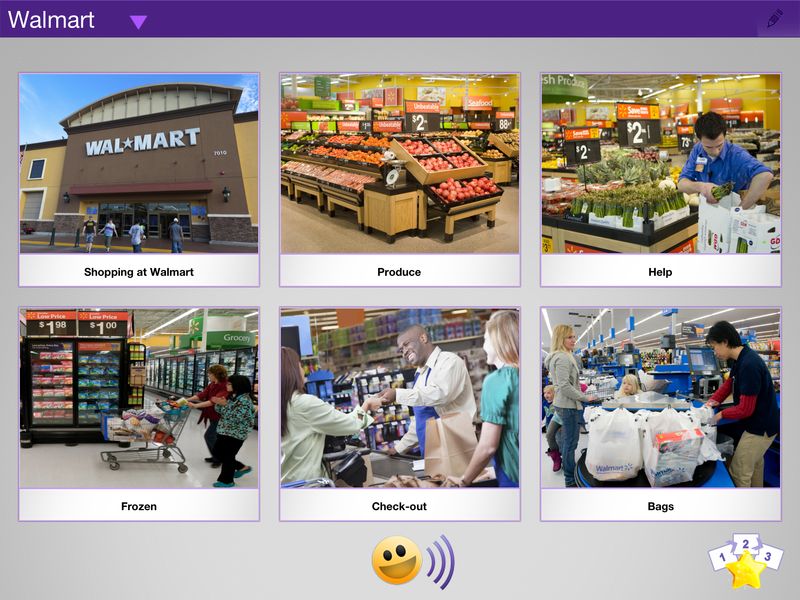 Each of these features are fully customizable with images and videos from your own environment that are easily understood! AutisMate’s visual approach to AAC allows caregivers to create contextual environments of a user that are perfect for those that are just starting to communicate. In just a few minutes, caregivers can upload their own custom videos, images and audio, or take them right on the iPad. You can even draw your own hotspots in these scenes! AutisMate provide you with a fully featured sentence builder that includes a basic core vocabulary that is fully customizable. More vocabularies will be available soon in our sentence builder! ➤ Visual Schedules Visual Schedules are a great way to provide visual cues about daily activities. These help with learning and doing routines more independently. These visual schedules also let you associate visual timers, videos, and stories with each task! Visual stories are a great way to teach communication, behavioral skills, and social skills! ➤ GPS-enabled Scenes can be tied to the app’s physical location through GPS, presenting users with scenes from their current location right away. 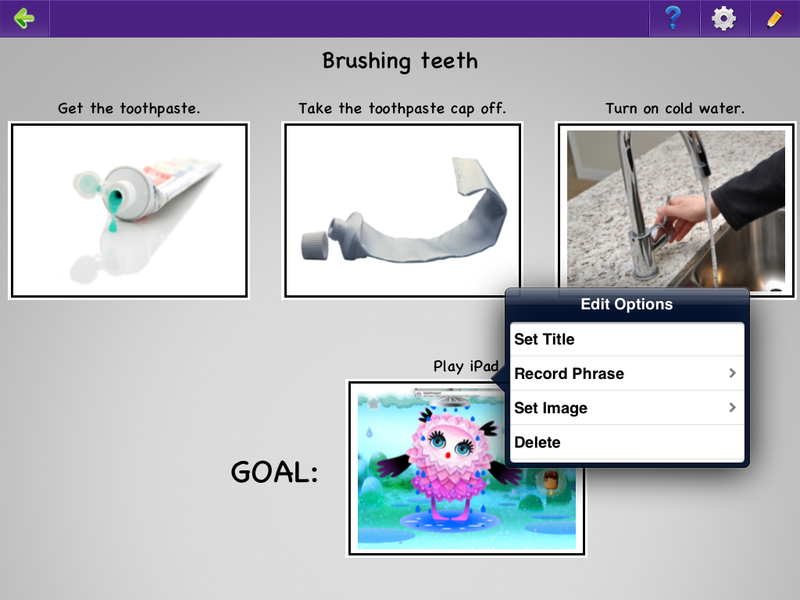 Share scenes, visual schedules, AAC vocabularies and more via e-mail right from within AutisMate. Everything you can create can be shared instantly between teachers, parents, professionals, and friends. Whether it’s a question or an idea for a new feature, our support team is always there for you. Just tap on the email support from within the app or visit our website to send us your inquiry. Note: When upgrading from AutisMate 1.0 to AutisMate 2.0, your current user will not have the included core vocabulary or demo visual schedules. The easiest way to see all the new functionality is to create a new user. While in edit mode (default password “1111”), tap on the setting button in the top right of the screen and select users->new user, and then tap DEMO when prompted..
You can access the vocabulary and schedules in your previous user by creating a new user, and then sharing the vocabulary and grids by going to the in-app settings and tapping share->share grids/schedules->iTunes and selecting the vocabulary/schedules you would like to share. Then switch back to your original user and select import grids/schedules from the share menu. This issue will also be fixed in an update coming soon. E-mail us at info@specialneedsware, or from within the app by tapping the “?” button for support. Easier to customize than ever! I would love to be entered into the raffle for autismate but I don’t see an entry form. How do I enter? Can I have someone else enter for me? Michele, please click on ‘a rafflecopter giveaway’ the highlighted words under the word Giveaway and it will take you to another screen, where you have to ‘like’ a page etc, I have included many options for you to choose from, as some people are not able to do all of the things. Please message our facebook page, if you have any further questions. https://www.facebook.com/TheAppyLadies If they win, they can certain give you the app. I would love to start this program with my 20 year old son. He used PECS for a long time, but now that he has his ipad life for him has really changed in a very positive way! I would love to introduce this very awesome program to him. I have the honor of takin care of a. Child with severe autism along with his older brother that is higher functioning. He was “in his own world” For some reason he choose me to bond with and came into my world and allowed me into his! He is non verbal and never could make his needs known with me he is learning but still gets frustrated a lot cause I don’t always know what he is trying to tell me. He didn’t make any type of pregress till after he turned 12 because of this and earlier test the school and MHMR won’t even talk about getting him a speech tablet. This app has me sp excited cause I do think he could be able to learn to communicate it just takes time patience and love! Sadly he hasn’t had a lot of caregivers that see him as more than a paycheck! He has wonderful parents that actually adopted him and his biologic brother as well as another special needs child but his mom is handicap now and both are in their 60s with 3 mentally and physically handicapped children in the home! This could be the mirical that helps him live a normal life! Thanks for caring enough to not just help your loved ones but everyone!